NI myRIO Project Essentials Guide cover. 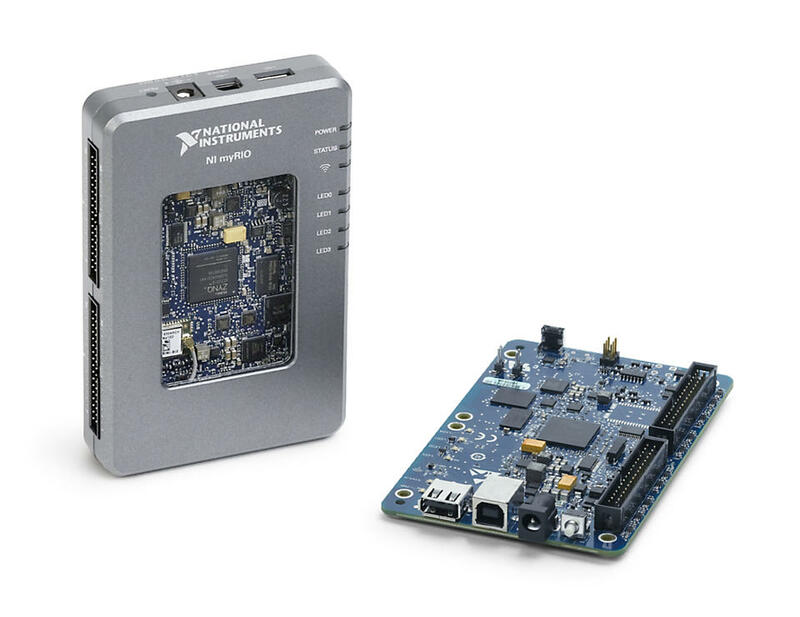 The myRIO Project Essentials Guide serves as the guide to interfacing NI myRIO to the wide variety of sensors, actuators, and displays contained in the NI myRIO Starter Kit, NI myRIO Mechatronics Kit, and NI myRIO Embedded Systems Kit that students will need for projects. Each project concentrates on a specific component or device using a mixture of text and video to guide the student through the learning process necessary to successfully integrate the component or device into the student's system. Students learn the concepts and characteristics of common sensors, actuators, and electrical components. Students build conditioning circuits and run LabVIEW software to observe the functionality of sensors, actuators, and other electrical components. Students apply concepts and observations by integrating sensors, actuators, and electrical components into system-level projects. In this project, students learn the essential concepts related to LEDs. Students complete activities of that demonstrate the interface theory and operation of LEDs, in which students can apply to future integrated projects utilizing this component. Through these activities, students follow steps to demonstrate correct operation of the discrete LED, watch videos involving theory, and participate in a short activity after each video. This project teaches students how to display information using the array of LEDs that make up a seven-segment display. Students complete activities of component demonstration and interface theory, in which students can apply to future integrated projects utilizing this component. Through these activities, students follow steps to demonstrate correct operation of the LED display, watch videos involving theory, and participate in a short activity after each video. In this project, students learn the essential concepts associated with a pushbutton switch and apply software-based edge detection to convert a pushbutton press into a trigger event using myRIO and LabVIEW. Through these activities, students follow steps to demonstrate correct operation of the pushbutton switch, watch videos involving theory, and participate in a short activity after each video. In this project, students learn to describe concepts related to dip switches and examine both SPST and rotary-style dip switches. Students interface myRIO with each dip switch and use LabVIEW to interpret the switch open-close patterns as a numerical value, binary array, and individual bit fields. Through these activities, students follow steps to demonstrate correct operation of the DIP switches, watch videos involving theory, and participate in a short activity after each video. This project provides students with the tools and activities to learn the properties, principles of operation, and interface theory of relays. Students complete activities where they implement a circuit to interface myRIO with a relay, and use LabVIEW to set the relay on and off. Through these activities, students follow steps to demonstrate correct operation of the relay, watch videos involving theory, and participate in a short activity after each video. This project provides students with the tools and activities to learn the properties, principles of operation, and interface theory of potentiometers. Students complete activities that demonstrate different applications of potentiometers, which students can apply to future integrated projects utilizing this component. Through these activities, students follow steps to demonstrate correct operation of the potentiometer, watch videos involving theory, and participate in a short activity after each video. This project introduces students to the thermistor principles of operation, measurement of thermistor resistance, conversion of measured resistance to temperature, and sizing of the voltage-divider resistor for the best measurement sensitivity and range. Students complete activities that demonstrate component operation and interface theory so that students can use thermisters in future integrated projects. Through these activities, students follow steps to demonstrate correct operation of the thermistor, watch videos involving theory, and participate in a short activity after each video. In this project, students will learn the photocell principles of operation, measure photocell resistance, and size a voltage-divider resistor for the best measurement sensitivity and range. Students will complete activities that will demonstrate component operation and interface theory, so that they can use photocells in integrated projects. In these activities, students will follow steps to demonstrate correct operation of the photocell, watch videos involving theory, and participate in a short activity after each video. In this project, students learn the electret microphone operating principles and interface it with myRIO. In the activity, students use LabVIEW to view audio signals, and can observe how different sounds affect the signal. Students follow steps to demonstrate correct operation of the electret microphone, watch videos involving theory, and participate in a short activity after each video. In this project, students will learn the principle operations of a buzzer, the circruitry required for buzzer operation, and interfacing techniques for controlling buzzer sounds. Students complete activities to build the interface circuit and use myRIO and LabVIEW to control the buzzer. In these activities, students follow steps to demonstrate correct operation of the buzzer/speaker, watch videos involving theory, and participate in a short activity after each video. In this project, students will learn the DC motor principle of operation, complete circuitry for operation and protection, and use myRIO and LabVIEW to control rotational motion. Students will complete activities that demonstrate the DC motor operation and interface theory, so that they can apply to future integrated projects utilizing this component. Through these activities, students will follow steps to demonstrate correct operation of the motor, watch videos involving theory, and participate in a short activity after each video. In this project, students will learn the principles of operation of encoders, circuitry requirements for operation and debounce, and interfacing techniques for measuring rotational position. Students complete activities to build the interface circuit and use myRIO and LabVIEW to translate quadrature waveforms to rotational position and direction. Through these activities, students follow steps to demonstrate correct operation of the rotary encoder, watch videos involving theory, and participate in a short activity after each video. In this project, students will learn the principle operations of a photointerupter, the circuitry required for operation, and interfacing techniques to sense when the light path between the emitter and detector is blocked. Students complete activities to build the interface circuit, and use myRIO and LabVIEW to collect data and translate it into position and speed measurements. Through these activities, students will follow steps to demonstrate correct operation of the photointerruptor, watch videos involving theory, and participate in a short activity after each video. This project introduces students to the Hall-effect principle, sensor latching and switching behaviors, and hall-effect sensor interfacing techniques for detecting proximity and sensing position and speed. Students build an interface circuit, and use myRIO and LabVIEW to acquire the signal and interpret speed and position. Through these activities, students follow steps to demonstrate correct operation of the hall-effect sensor, watch videos involving theory, and participate in a short activity after each video. This project introduces students to the piezoelectric effect, and using a piezoelectric sensor to detect shock and vibration. Students build an interface circuit, and use myRIO and LabVIEW to observe how flexing a piezo sensor affects voltage. Through these activities, students follow steps to demonstrate correct operation of the Piezoelectric-Effect sensor, watch videos involving theory, and participate in a short activity after each video. In this project, students learn the about the operation, interface, and control of standard and continuous operation servos. In the activity, students connect servo motors to myRIO and use LabVIEW to control rotational position via PWM. Through these activities, students follow steps to demonstrate correct operation of the servo, watch videos involving theory, and participate in a short activity after each video. In this project, students learn the H-bridge principle of operation, use PWM to control the speed and direction of rotation of a motor shaft, and use an encoder to measure motor shaft position and speed. Through these activities, students follow steps to demonstrate correct operation of the motor, watch videos involving theory, and participate in a short activity after each video. This project introduces students to the operation, interface theory, and features of an IR sensor. Students build an interface circuit and use LabVIEW and myRIO to acquire and display proximity data. Through these activities, students follow steps to demonstrate correct operation of the IR sensor, watch videos involving theory, and participate in a short activity after each video. In this project, students learn the principles of operation and applications of a sonic range finder, as well as the principles of the UART communication protocol. Students use myRIO and LabVIEW to calibrate and sense distance using a sonic range finder. In these activities, students follow steps to demonstrate correct operation of the sonic range finder, watch videos involving theory, and participate in a short activity after each video. In this project, students learn the principles of operation and applications of an accelerometer, as well as the principles of the I2C communication protocol. Students use myRIO and LabVIEW to calibrate and measure three axes of acceleration using an accelerometer. In these activities, students follow steps to demonstrate correct operation of the accelerometer, watch videos involving theory, and participate in a short activity after each video. In this project, students learn the principles of operation of a gyroscope and the I2C communication protocol. Students use myRIO and LabVIEW to calibrate a gyroscope and acquire angular velocity data via the I2C communication protocol. In these activities, students follow steps to demonstrate correct operation of the gyroscope, watch videos involving theory, and participate in a short activity after each video. In this project, students learn the principles of operation and applications of a compass, as well as the principles of the I2C communication protocol. Students use myRIO and LabVIEW to calibrate and sense magnetic strength using a compass. In these activities, students follow steps to demonstrate correct operation of the compass, watch videos involving theory, and participate in a short activity after each video. In this project, students learn the principles of operation and applications of a sonic range finder, as well as the principles of the SPI communication protocol. Students use myRIO and LabVIEW to calibrate and sense light intensity using an ambient light sensor. In these activities, students follow steps to demonstrate correct operation of the ambient light sensor, watch videos involving theory, and participate in a short activity after each video. This project teaches students how to interpret data from the switch array that makes up a keypad. Students complete activities that demonstrate the use of pull-up and pull-down resistors, and how single and multi-key presses can be decoded using myRIO and LabVIEW. In these activities, students follow steps to demonstrate correct operation of the LED display, watch videos involving theory, and participate in a short activity after each video. In this project, students learn the principles of operation and applications of an LCD screen, as well as the principles of the UART communication protocol. Students use myRIO and LabVIEW to display the states of the myRIO embedded accelerometer and push button on the LCD screen. In these activities, students follow steps to demonstrate correct operation of the LCD Screen, watch videos involving theory, and participate in a short activity after each video. In this project, students learn the principles of operation and applications of an LCD screen, as well as the principles of the SPI communication protocol. Students use myRIO and LabVIEW to display the states of the myRIO embedded accelerometer and push button on the LCD screen. In these activities, students follow steps to demonstrate correct operation of the LCD Screen, watch videos involving theory, and participate in a short activity after each video. In this project, students learn the principles of operation and applications of an LCD screen, as well as the principles of the I2C communication protocol. Students use myRIO and LabVIEW to display the states of the myRIO embedded accelerometer and push button on the LCD screen. In these activities, students follow steps to demonstrate correct operation of the LCD Screen, watch videos involving theory, and participate in a short activity after each video. In this project, students learn the principles of operation of an LED matrix, and techniques for displaying patterns and animations. Students will complete the interface circuit, and use myRIO and LabVIEW to control the red and green LEDs in the matrix to display interesting patterns. In these activities, students follow steps to demonstrate correct operation of the LED matrix, watch videos involving theory, and participate in a short activity after each video. This project introduces students to memory devices, the interface theory and function of EEPROMs, and the SPI communication protocol. Students complete an activity to build an interface circuit, use myRIO and LabVIEW to read and write to an EEPROM, and observe capabilities and characteristics of the EEPROM. Through these activities, students follow steps to demonstrate correct operation of the serial EEPROM, watch videos involving theory, and participate in a short activity after each video. This project introduces students to data communication over Bluetooth radio, the interface theory and operation of a Bluetooth module, and UART communication. Students complete an activity to use myRIO and LabVIEW to send and receive data over Bluetooth via the Bluetooth module. Through these activities, students follow steps to demonstrate correct operation of the Bluetooth module, watch videos involving theory, and participate in a short activity after each video. This project introduces students to the operation, interface theory, and features of a digital potentiometer and the SPI communication protocol. 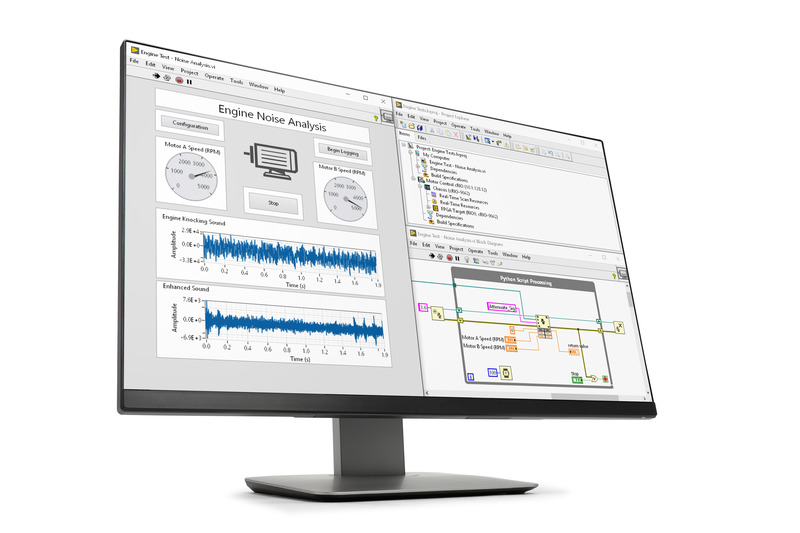 Students complete an activity to build an interface circuit, use LabVIEW and myRIO to set the virtual wiper position, and observe the resulting change in resistance. Through these activities, students follow steps to demonstrate correct operation of the digital potentiometer, watch videos involving theory, and participate in a short activity after each video. This project introduces students to the operation, interface theory, and features of a digital temperature sensor and the I2C communication protocol. Students complete an activity to build an interface circuit, use LabVIEW and myRIO to collect temperature data and set a temperature alert limit. Through these activities, students follow steps to demonstrate correct operation of the temperature sensor, watch videos involving theory, and participate in a short activity after each video. This project introduces students to the operation, interface theory, and features of a MEMS microphone and basic audio theory. Students complete an activity to build an interface circuit, use LabVIEW and myRIO to acquire and display an audio signal, and amplify the microphone signal with an op amp. Through these activities, students follow steps to demonstrate correct operation of the MEMS microphone, watch videos involving theory, and participate in a short activity after each video. This project introduces students to H-Bridges and the operation, interface theory, and features of a DC motor and rotory encoder. Students complete an activity to build an interface circuit and use LabVIEW and myRIO to drive the DC motor, and observe the change in position in the encoder. Through these activities, students follow steps to demonstrate correct operation of the DC motor and encoder, watch videos involving theory, and participate in a short activity after each video. This project introduces students to logging data on myRIO. Students use LabVIEW to monitor the myRIO onboard accelerometer, and saves the data as a spreadsheet onto a USB flash drive. They also monitor the flash drive capacity and free space and file directory. Through these activities, students follow steps to demonstrate data logging, watch videos involving theory, and participate in a short activity after each video. In this project, students use myRIO to acquire and process image data from a webcam. This includes configuring the webcam and acquiring and processing single images and video streams. Through these activities, students follow steps to demonstrate correct operation of the webcam, watch videos involving theory, and participate in a short activity after each video. This project introduces students to GPS concepts like trilateration, data parsing, and the operation, interface, and features of a GPS receiver. Students use myRIO and LabVIEWto acquire, process, and display GPS signals from a satellite. Through these activities, students follow steps to demonstrate correct operation of the GPS receiver, watch videos involving theory, and participate in a short activity after each video. This project introduces students to the RFID tag standard, the UART communication protocol, and the operation, interface,and features of an RFID reader. Students use myRIO and LabVIEW to detect RFID tags, acquire data from the RFID tags, and parse the message. Through these activities, students follow steps to demonstrate correct operation of the RFID reader, watch videos involving theory, and participate in a short activity after each video. After completing projects in the myRIO Project Essentials Guide, students can utilize their new skills with these project ideas. Students can complete integrated projects such as Digital Thermometer, 3-D Color Controller, QR Code Scanner, and Safe Controller. Each project integrates multiple components, and requires students to recall information they have learned in previous projects and apply that knowledge to these integrated projects. 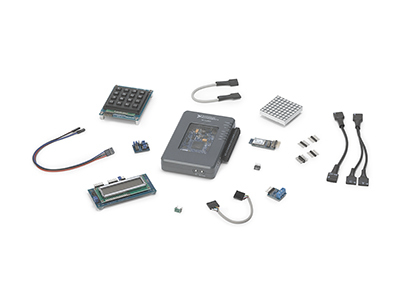 Includes sensors, devices, and a display for teaching and implementing embedded systems concepts. 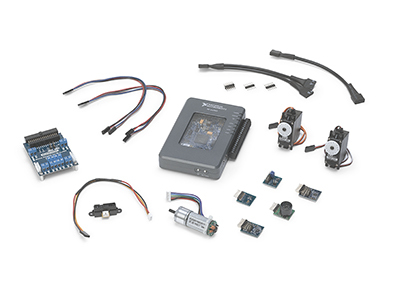 Includes motors, sensors, and resources for teaching and implementing mechatronics concepts. 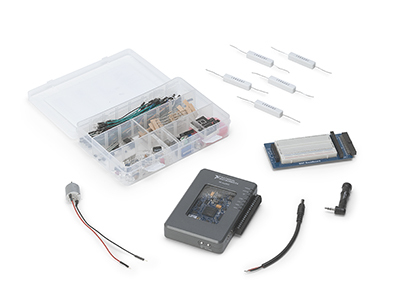 Includes sensors and components needed for basic projects. Students have the opportunity to engage in custom projects to learn sensor and actuator integration and basic programming.